LONDON, England (CNN) -- Michael Jackson had a level of hero worship on a par with Elvis Presley or the Beatles but he was the first black star to inspire such a massive following around the world. Michael Jackson, the ultimate showman, craved attention and was rarely disappointed. Steve Greenberg, founder and CEO of S-Curve Records, was a disc jockey in Tel Aviv, Israel, when "Thriller" first dropped and witnessed first-hand how Jackson became an international icon. Jackson was known for far more than his music though. Speaking after his death in Los Angeles was announced, U.S. civil rights campaigner Rev. Al Sharpton paid tribute to the work of a "trailblazer" in helping people around the world through his charities. 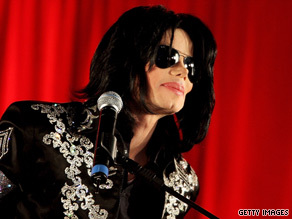 How will you remember Michael Jackson? Sharpton added that the song Jackson co-wrote with Lionel Richie, "We Are the World," a 1985 charity single that raised an estimated $50 million for famine relief in Africa, ushered in Live Aid and the era of celebrity philanthropy. But in the years after his colossal 1982 hit album "Thriller" and its 1987 follow-up "Bad," much of the focus did not cast him in a good light. In 1996 the lead singer of Pulp, Jarvis Cocker, caused a furor at the Brit Awards in London when he invaded the stage during Jackson's performance of "Earth Song" in protest "at the way Michael Jackson sees himself as some kind of Christ-like figure with the power of healing." Jackson failed to see the humor in Cocker's mockery, responding that he was "sickened, saddened, shocked, upset, cheated, angry" by the protest. He also alleged that Cocker had attacked children on stage, something that the Pulp singer denied. But many in the music industry backed Cocker, who was arrested but later released without charge. And in a 2003 interview with British journalist Martin Bashir that was supposed to repair his image around the world, the singer revived allegations of child abuse when he said of sharing a bed with a young boy: "It's a beautiful thing. It's very right, it's very loving. Because what's wrong with sharing a love?" A warrant was issued for his arrest on charges of sexually molesting 12-year-old Gavin Arvizo. Jackson surrendered himself to police amid a media furor. In the 2005 trial conducted in the glare of the world's media spotlight, Jackson was cleared of child molestation charges. Following the trial, Jackson's finances took a hit and he was forced to sell his Neverland ranch in California. He later kept a low profile in the United States and spent time in Britain, where his friends included psychic spoonbender Uri Geller and Harrod's owner Mohamed Al Fayed, and also in Bahrain. But in November last year, Jackson was sued by an Arab sheikh at the High Court in London for $7.7 million. They parted "amicably" after agreeing a settlement. Jackson had been invited with his children and entourage to Bahrain by the king's son, Sheikh Abdulla bin Hamad Al Khalifa, who lavished money on Jackson and built a recording studio, which he believed would be used to record albums by Jackson using material the sheikh had helped to write. But Jackson insisted there was no valid agreement and that the sheikh's case was based on "mistake, misrepresentation and undue influence." He said sums of money paid out by the sheikh were "gifts." As fans around the world mourn it is likely Michael Jackson will be remembered as a musical hero -- but also a man with human flaws.